November 4, 2015 By Todd Burgreen & filed under All Articles, Rifles & Carbines, Weapons. Many feel the utility of what Ronnie Barrett started in 1982 with his .50 BMG rifles has yet to completely evolve. The long-range potential of the .50 BMG mated with a Barrett rifle is what many feel is the ultimate combination of rifle and cartridge. 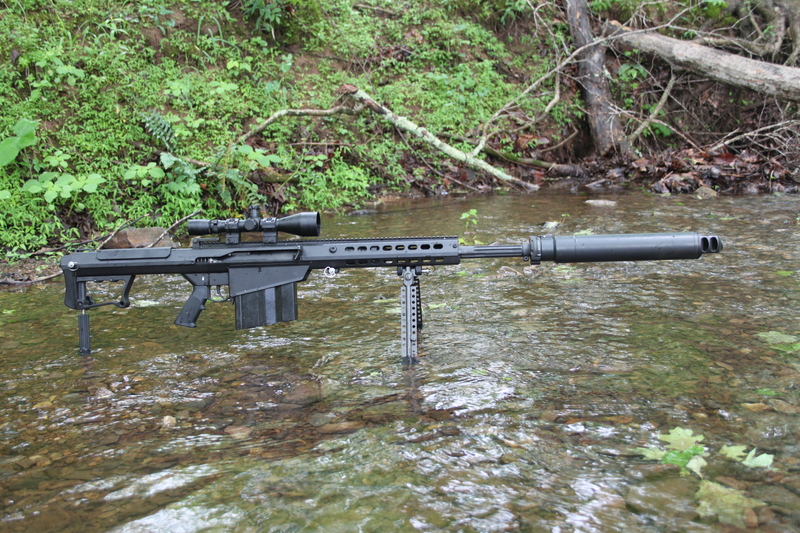 Barrett recently celebrated the 30th anniversary of the M82. Do not be surprised if Barrett .50 BMG rifles are still around to mark a 60th anniversary. It certainly seems Barrett is not resting on its laurels and continues to evolve its product line with improvements in materials and manufacturing techniques, the M107A1 being a case in point. Barrett’s Jeff Burch demonstrates M107A1 and QDL from the bench. The Ronnie Barrett story—of one man’s vision coming to represent a whole new class of weapon that harnessed the brute power of the Browning .50-caliber round—is a thing of legend. In the last 100 years, Barrett is the only individual to design, create, manufacture, market, and mass-produce his firearms for use by the United States military. Notable individuals who have invented firearms adopted by the United States military include John Browning, John Garand, Eugene Stoner, John Thompson, Melvin Johnson Jr., and Eugene Reising. None of them controlled their products or company’s destiny to the degree that Ronnie Barrett has. The .50 BMG’s power has been legendary since created by John Browning. Anecdotal history has Browning creating the .50 BMG by scaling up the .30-06 service round at the behest of General Pershing. The purpose of the .50 BMG was to serve in both an anti-aircraft and anti-vehicle role with the advent of the first tanks and armored cars that began roaming battlefields at the end of World War I.
Muzzle device found on 20-inch M107A1’s barrel permits quick attachment of Barrett QDL Suppressor. Browning’s .50 BMG, typified by its chambering in the M2 “Ma Deuce,” had always been thought of as either a crew-served weapon or something better fitted to a vehicle or similar platform in order to tame its power. Barrett Firearms Manufacturing, based in Murfreesboro, Tennessee, was founded in 1982 and centered on Ronnie Barrett’s idea of a shoulder-fired .50 BMG rifle. While many are familiar with the Barrett story thanks to several documentaries and articles, I will give a brief synopsis of the first Barrett .50 BMG based on archival interviews with Ronnie Barrett himself. Ronnie was a professional photographer and artist who wanted to create a rifle chambered in .50 BMG. He had no prior experience in manufacturing or as an engineer. He hand drew the design for what was to become the Barrett semiautomatic .50 BMG rifle. When he took the drawings to machine shops in the area, they laughed at his ideas. Instead of giving up, he decided to manufacture it himself. It is only fitting to begin with the Barrett model that started it all—the M82A1. 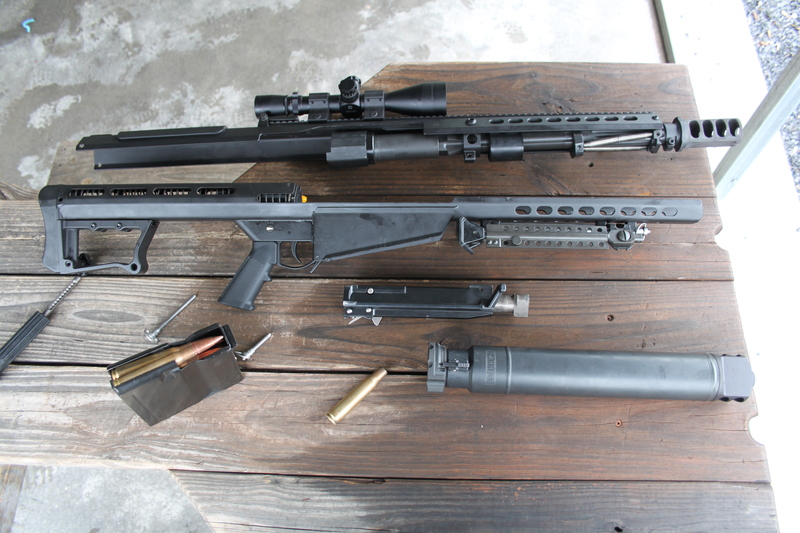 Ronnie Barrett’s instincts, as laid out on his kitchen table, proved very keen in making sure the M82A1’s construction was geared toward durability and reliability in the tactical arena. Barrett’s first conventional military success was the sale of about 100 M82A1 rifles to the Swedish Army in 1989. World events transpired to give Barrett a major impetus toward success in 1990, when the United States armed forces purchased significant numbers of the M82A1 during Operations Desert Shield and Desert Storm in Kuwait and Iraq. The U.S. Marine Corps initially bought about 125 rifles, and orders from the Army and Air Force soon followed. In addition to the United States, Barrett M82A1 rifles have been bought by various military and police forces from allied/friendly governments including Belgium, Chile, Denmark, Finland, France, Germany, Greece, Italy, Jamaica, Mexico, the Netherlands, Norway, the Philippines, Saudi Arabia, Spain, Sweden, Turkey, and the United Kingdom. 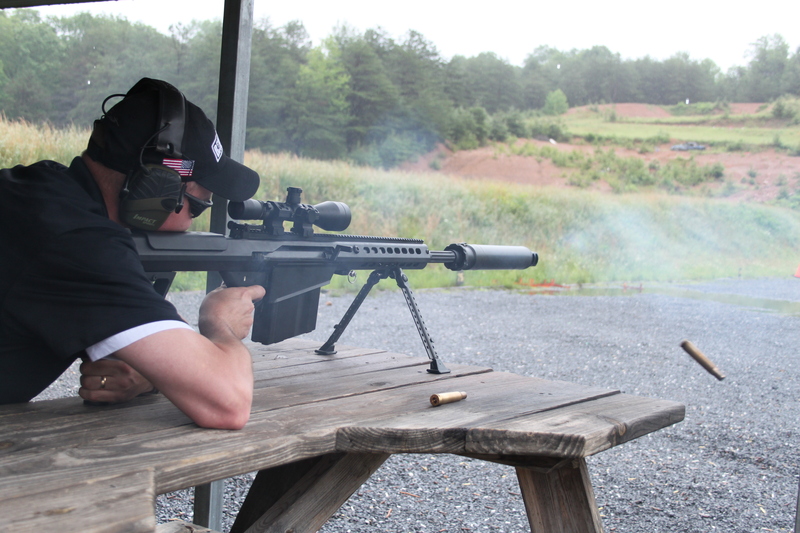 Barrett QDL Suppressor enhances M107A1’s performance by reducing muzzle signature when fired. The M82A1 has steadily evolved over the years, with the latest iteration the Barrett M107A1. This design modification is a result of battlefield requests from operators using the big Barrett rifles afield. Pounds equal pain for the warfighter on the ground. The M107A1 addresses this with a revisiting of materials used in its construction. Aluminum, stainless steel, and titanium are used where possible to shave weight. The end result is the M107A1 weighs five pounds less than its predecessors. This is gained via an aluminum upper receiver that features an integral 27 MOA optics rail. 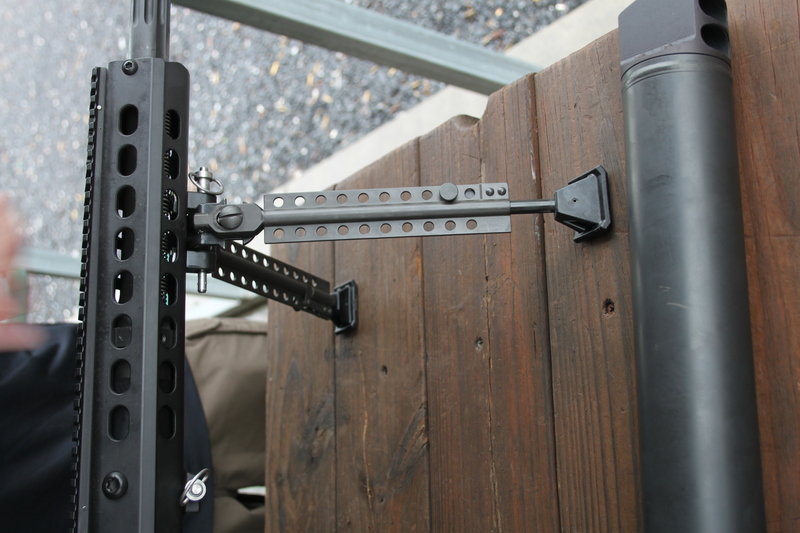 The Barrett bipod also contributes to weight reduction with titanium in the legs. The redesigned bolt carrier moves on a hardened steel wear strip. The titanium barrel key and chrome-lined bore and chamber add to durability and field resilience. The bolt, accelerator rod, accelerator, bolt assist, and firing pin are Nickel Teflon (NP3) coated. This increases lubricity and provides increased corrosion resistance, which greatly eases cleaning. The M107A1’s lower receiver includes a new aluminum recoil buffer system specially designed for use with the Barrett QDL Suppressor. Barrett M107A1 field stripped for inspection. Even more operator feedback resulted in Barrett adding the ability to be suppressed to the M107A1’s repertoire. The Barrett QDL Suppressor addresses the need to reduce the .50 BMG’s muzzle signature without reducing reliability—no small task considering semiautomatic operation and the recoil forces generated with .50 BMG rifles. This suppression capability sets the M107A1 apart from its Barrett semiauto brethren. In fact, the M107A1 operating mechanisms are not interchangeable with M82A1 or M107 rifles. For example, the M107A1’s bolt assist is not found on the M82A1. The bolt assist is held in place by the accelerator rod on the M107A1’s bolt group. The QDL Suppressor is not for use on the Barrett M82A1 or M107. The QDL offers sound reduction in the 23 to 25 decibel range. Earmuffs are still recommended. 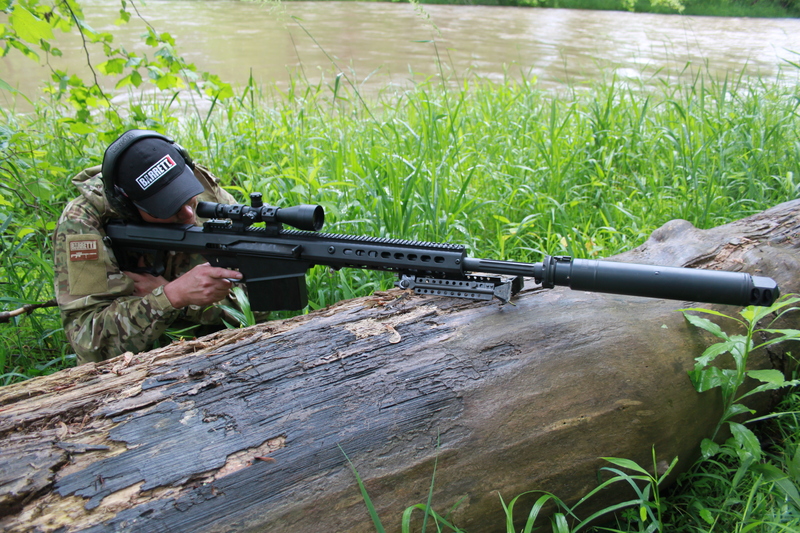 What the QDL Suppressor offers is a significant reduction in muzzle signature and blast. The QDL assists in reducing the chance your position is given away when firing the M107A1. Barrett has incorporated titanium in M107A1’s bipod legs, leaving no stone unturned in their quest to reduce weight while increasing strength. The typical “thump” to the chest and assault on your other senses is drastically reduced with the QDL Suppressor mounted. Measuring 2.5 inches in diameter and 15 inches long, it looks like a small muffler. 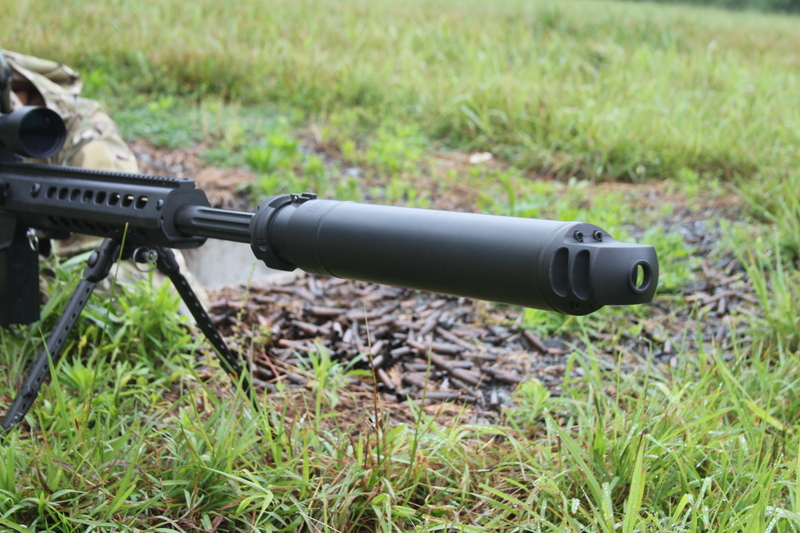 The Barrett QDL Suppressor adds nearly five pounds to the M107A1 when attached, and in my opinion is well worth it. The QDL Suppressor incorporates a removable two-port muzzle brake. This is in acknowledgement of the blast generated from touching off a .50 BMG even with a suppressor mounted. The QDL Suppressor is a dual layered tube design constructed of heat-treated high-strength alloys redundantly welded around the circumference of the QDL. 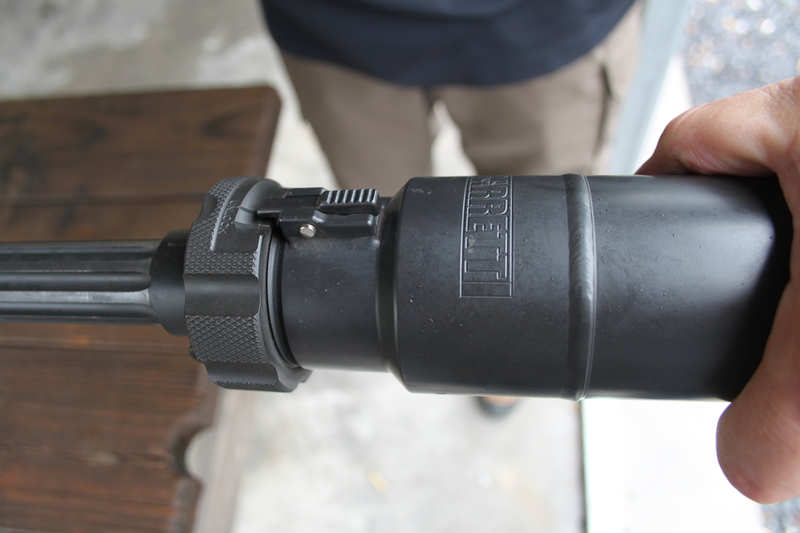 The QDL is simple to install via sliding it over the M107A1’s muzzle brake. Barrett uses a lock-ring coupler that clicks into ratchet grooves for a secure, repeatable fit installed in seconds. 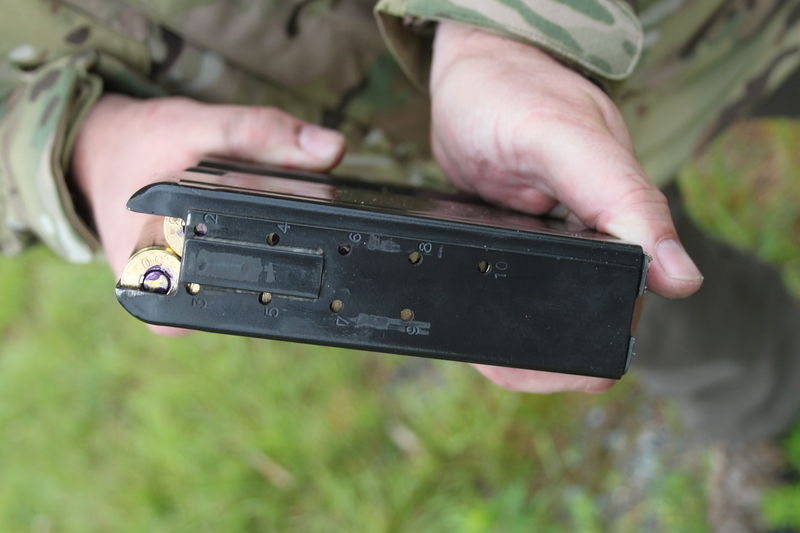 Witness holes are incorporated on M107A1’s ten-round magazine. The M107A1 evaluated herein featured a 20-inch fluted barrel with overall length of 48 inches and weight of 27 pounds. A 29-inch barreled version is also available. 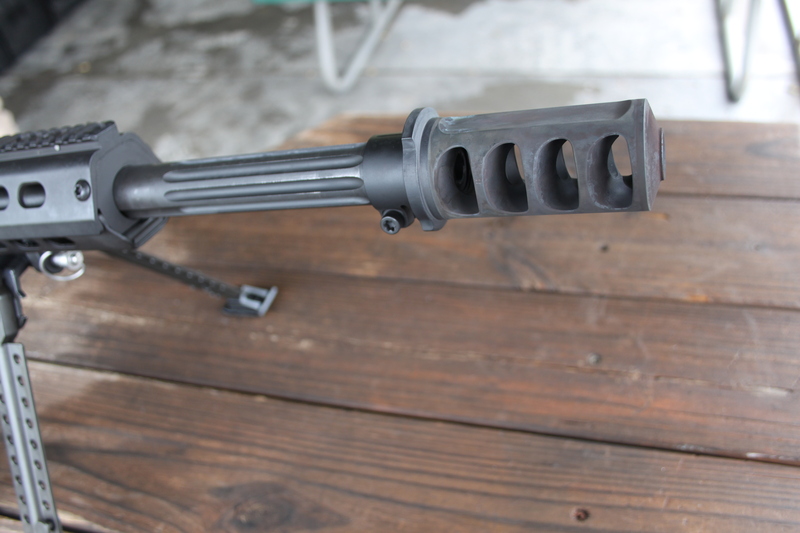 The M107A1’s barrel comes equipped with Barrett’s cylindrical four-port suppressor-ready muzzle brake. Like other Barrett semi-auto .50 BMG rifles, the M107A1 is fed from a ten-round detachable magazine. Reliability is something that cannot be compromised with a tactical rifle regardless of caliber. Barrett has altered the M107A1 bolt and dual recoil springs to ensure functioning when firing with the QDL Suppressor. The M107A1’s barrel moves about an inch rearward during the recoil cycle. Considering the brute power of the .50 BMG, I have always marveled at how well recoil is tamed with Barrett rifles. My unscientific opinion is that recoil feels between a 20 and a 12 gauge with the M107A1. Well thought-out ratchet design allows for quick mounting of QDL with reliable indexing. The M107A1’s size makes it more of a fixed-position platform perfect in an overwatch role, especially with its extended effective range and power. One role it has been pressed into is a close-range weapon found at checkpoints and gated entrances to bases and facilities. Developments in .50 BMG ammunition are keeping pace with the rifle component of the platform. This serves to wring even more range and lethality from the Barrett M107A1. Nothing will shut down an engine block faster than an incendiary/HE Raufoss Mk211 .50 BMG round if a driver is not complying with approach procedures. The Barrett M107A1’s aesthetics instill a certain sense of purpose. The purpose is allowing one rifleman to dominate his space on the battlefield against myriad targets. The M107A1 is a weapon with unsurpassed power and effective range for a shoulder-fired weapon. Barrett manufacturing quality and attention to detail provide an accurate, rugged, and reliable weapon that wrings the utmost performance out of the .50 BMG capabilities with the M107A1. The ability to configure the M107A1 with either a 20- or 29-inch barrel goes back to an earlier Barrett model—the M82A1 CQ, which featured a 20-inch barrel. The shorter barrel lightens the M107A1 by approximately two pounds and goes back to a Coast Guard request for a .50 BMG rifle for drug interdiction. The specific application involved Coast Guard watercraft or helicopters having to deliver accurate fire to stop high-speed drug runners. The favorite method to stop a smuggler’s boat was a.50 BMG round into a motor compartment. The power of the .50 BMG, combined with accurate semi-auto fire from a Barrett rifle, was the perfect choice for this mission. The full-size M82A1 or M107A1 was difficult to handle in small boats or helicopters, and made tracking fast-moving targets problematic. Faced with these challenges, Barrett responded by developing a carbine version of the M82A1—the M82A1 CQ. A similar situation resulted in the creation of the M107A1. Crew members on a helicopter or teammates working in close proximity appreciate a QDL-equipped M107A1. Field-expedient positions were explored with Barrett M107A1 around Echo Valley Training Center’s varied terrain. A unique opportunity presented itself to experience the M107A1 and QDL Suppressor with Barrett’s Director of U.S. Commercial Sales Jeff Burch visiting Echo Valley Training Center (EVTC). Jeff is intimately familiar with the M107A1 thanks to extensive travels demonstrating and training users on the platform. We met at EVTC to take advantage of its multiple bermed training bays and other unique opportunities found on the property. EVTC has fixed dug-in firing positions that proved perfect for this evaluation. The shooter can remain standing while maintaining the Barrett rifle firing from off the ground stabilized by bipod. This proved easier for managing recoil compared to lying behind the rifles in a more traditional prone position. With good ammunition—not delinked bulk FMJ—sub-MOA accuracy is obtainable with the M107A1. The large .50 BMG rounds often exhibit the phenomena of going to “sleep” after traveling some distance downrange. Let me explain. Barrett M107A1’s aesthetics instill a sense of professionalism and purpose. Accuracy levels at 100 yards are often improved upon at 300 yards. For example, a 100-yard group measuring an overall dimension of 1.5 inches is often followed by a 300-yard group measuring less than three inches. One would expect the 1.5-inch group at 100 yards to generate a 4.5-inch group at 300 yards. 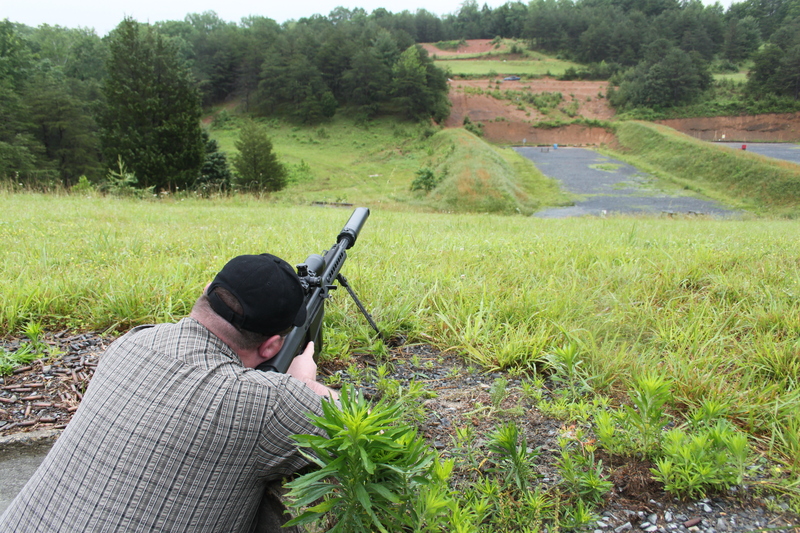 Burch reported and then demonstrated phenomenal accuracy from the demo M107A1s he has been using. A five-round group at 100 yards measured .736 inch at 100 yards, and five rounds and ½ MOA at 200 yards removed any doubt. In short, “minute of man” is well within the Barrett’s capabilities at mind-blowing distance. The Barrett M107A1 will exceed your expectations in terms of accuracy. Remember that the military uses the Barrett .50 BMG rifle, whatever specific model it may be, as an anti-materiel weapon. Yes, rounds on enemy personnel have happened, especially in current theaters of operation in Iraq and Afghanistan, but this is not the primary mission role of the big Barrett rifles. The longer the Barrett .50 BMG platform remains in service, the more varied its mission becomes. The uniqueness of the Barrett continues to allow its users to explore new applications. The M107A1 fully characterizes this flexibility. The M107A1 totally satisfies the U.S. military labeling of it as “Special Applications Scope Rifle” (SASR). Todd Burgreen has been a freelance writer for 20 years, with articles appearing in numerous publications. He has attended many personal defense, team tactics, firearms, and driving courses from some of the country’s most influential training personalities and schools.